EcoUrban: Building Sustainable Solutions: Starting the New Year with a BANG!!! Starting the New Year with a BANG!!! 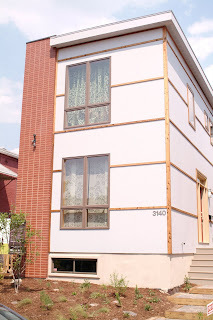 Our LEED for Homes Platinum dwelling @ 3140 Pennsylvania finally got the facelift we had been planning for several months with the installation of recycled aluminum cladding over the cedar battons. It was time we figured to quiet the detractors and to prove that contemporay modern design can be a quality addition to a traditionally historic neighborhood. Local contractor Mike Solomon put the cladding from Foreman Fabricators on over the past few days...and I can tell you the number of drive-bys applying their brakes has increased 10-fold. Have a great start to the year and be sure to check out the updates to our display and our two historic homes @ 3103 & 3105 Magnolia. Jay - Congrats to you and all involved in your LEED Platinum Home! What an honor for you! FYI - I like the face lift also!